In 1977, researchers at the University of Minnesota School of Medicine pioneered the first TPIAT for the treatment of CP. At that time, islet cell isolation techniques, which had been pursued to treat insulin-dependent diabetes via allotransplant, yielded variable results and raised uncertainty regarding the future efficacy of TPIAT. Since then, advances in isolation and purification have improved islet transplant outcomes, and the practice of TPIAT has expanded. Today at UPMC, surgeons including McGowan Institute for Regenerative Medicine affiliated faculty member Abhinav Humar, MD, Clinical Director of the Thomas E. Starzl Transplantation Institute and the Chief, Division of Transplantation in the Department of Surgery at UPMC, performs about 10 of these surgeries a year. “It’s a big surgery and you’re losing the pancreas,” says Dr. Humar. In her report, Maria Simbra, MD, for KDKA/CBS Pittsburgh, says the problem with completely removing the pancreas is it has many important functions. It secretes enzymes important to digestion, and it makes insulin, a hormone important to process sugar and carbohydrates. The digestive enzymes are easily replaced, but without a pancreas, you would become diabetic. 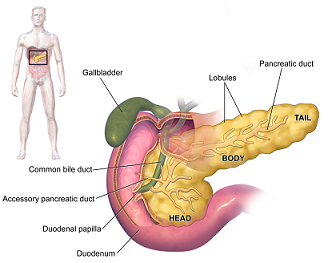 In a day-long operation, the pancreas is taken out and sent to the lab. It is chemically treated and disintegrated. The islet cells — the cells that produce insulin — are extracted and spun down into a small pellet. The pellet of cells is mixed with fluid, and the mixture is injected into the vein leading into the liver. There, the islet cells make a new home. Patients take insulin until the cells get established. Some people do not get pain relief — related to trouble getting off the narcotics, or an issue with the pain nerves themselves. As for the transplanted islet cells — one-third of the patients will have full function, one third will need some insulin, and another third will make no insulin of their own. Generally, the procedure works better, the more functioning islet cells you have. The longer you have pancreatitis, the more the cells degrade, and the transplant is less likely to work. “We’d like to try to see those patients earlier in their disease process because I think the likelihood of having a successful outcome is better in those types of situations,” says Dr. Humar.